THE ELECTION has returned a record number of women TDs – but only by a small margin. Some 23 women TDs had been elected by yesterday evening, with three other women candidates in contention to take seats in Galway West, Laois-Offaly and Wicklow. In both 2002 and 2007, 22 women TDs were elected, the highest number returned in a general election. By the end of the 30th Dáil, however, 23 out of 163 seats (14.1 per cent) were occupied by women deputies, thanks to Maureen O’Sullivan’s byelection victory in June 2009. At best, this total will be exceeded by three, that is, if all the remaining counts go in favour of those women candidates still in the shake-up. Of the 23 women TDs elected to date to the 31st Dáil, 10 are from Fine Gael: Heather Humphreys (Cavan-Monaghan), Áine Collins (Cork North West), Frances Fitzgerald (Dublin Mid West), Olivia Mitchell (Dublin South), Catherine Byrne (Dublin South Central), Lucinda Creighton (Dublin South East), Mary Mitchell-O’Connor (Dún Laoghaire), Nicky McFadden (Longford-Westmeath), Michelle Mulherin (Mayo) and Regina Doherty (Meath East). Labour has seven women TDs: Ann Phelan (Carlow-Kilkenny), Kathleen Lynch (Cork North Central), Joanna Tuffy (Dublin Mid West), Róisín Shortall (Dublin North West), Joan Burton (Dublin West), Jan O’Sullivan (Limerick City) and Ciara Conway (Waterford). Sinn Féin has two women TDs: Sandra McLellan (Cork East) and Mary Lou McDonald (Dublin Central), while four other women TDs have been elected to date: Maureen O’Sullivan (Ind, Dublin Central), Clare Daly (ULA, Dublin North), Joan Collins (ULA, Dublin South Central) and Catherine Murphy (Ind, Kildare North). Fianna Fáil – which of all the parties had run the lowest percentage of women candidates (11 out of 75) – returned no women TDs and lost high-profile deputies Mary Coughlan, Mary Hanafin and Mary O’Rourke. Three constituencies – Dublin Central, Dublin South Central and Dublin Mid West – elected two women. Of 566 candidates in the election, 86 were women (15.2 per cent). Counts were continuing last night in Galway West and Laois-Offaly and will continue today in Wicklow where Catherine Connolly (Ind), Marcella Corcoran-Kennedy (FG) and Anne Ferris (Lab) respectively were all challenging for seats. The number of women TDs in the Dáil reached the 20 mark for the first time in 1992 when nine new women deputies were elected. Since then the number has changed very little, with 23 the highest number of women in the Dáil at any one time. After many hours of waiting for the final results Maureen was elected in the early hours of Sunday morning after the seventh count. The final result showed that Maureen topped the poll, exceeding the quota by some 1500 votes. 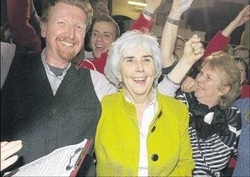 Tired but happy Maureen paid tribute to her supporters many of whom waited through the long hours of the count with her in the RDS. "I have to admit being initially disappointed coming in a percentage behind S.F. after the first count but that initial disappointment totally disappeared as the night went on and in the end we took the third seat and with a quota! Congratulations to Pascal, Joe and Mary Lou and commiserations to those who stood in Dublin Central and were not successful. It looks like it is going to be an interesting Dáil." This page is an archive of the three week election campaign carried out by Maureen and her supporters. 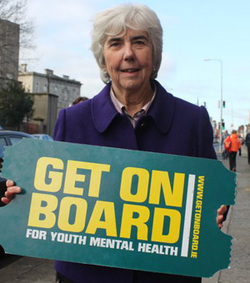 The problem of mental health difficulties among young people is unfortunately a growing problem in our society. Since I was a teenager growing up in my community in East Wall, I have worked with the community activists to provide better facilities for young people, better educational facilities, better recreational facilities, better support facilities for young people in difficulties. My work as a guidance counsellor brought me even nearer to the heart break mental health difficulties in young people can cause to the young person and their families. For this reason I have joined the Get on Board initiative, because I believe that if we all try to act together to change things, then change is possible. This morning I was invited to speak with a group of American students. Fr Peter Mc Verry had spoken to them yesterday and the group had visited Mayo and met some of the Rossport group. I gave them my take on Irish politics! That was followed by a meeting with the women's group in Saol project, Amiens Street, again talking about why I was standing in this election. Most of them had known Tony. The rest of the day was canvassing, dropping leaflets: a great crowd of East Wallers out this afternoon to cover East Wall. Last few hours of canvass ahead. All credit to a fantastic group of supporters, canvassers, friends - all committed, enthusiastic, good humoured - just brilliant. Thank you all! Last night's meeting was held in Freeman hall, deep in Mater Hospital, down many corridors left and right. It turned out to be a passionate and constructive debate with an audience of some 60 people, with inputs from freelance health journalist Sara Burke & Dr Austin O'Carroll on health inequalities in Ireland generally & in Dublin Central in particular. The debate was addressed by many of candidates, including Maureen O'Sullivan and other main contenders for the 4 TD seats. 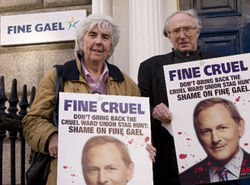 FG Fair Care and universal health insurance took a hammering. The level of debate was good with the conclusion that we need more facilities and we need action. It was stated that health inequality is directly linked to poverty, no where more than in Dublin Central and especially the North Inner City. This remains and grows with cuts in public services poor housing, lower level of education attainment & unemployment. A lot more practical steps need to be taken. The people receiving & delivering health services need to be listened to and they needed to be supported. Maureen made the point that healthcare in Dublin Central has great well trained staff, has large resources that can be better used. Once past waiting times & rooms there is excellent care but practical steps are needed not more managerial restructuring or a new imported market-led model. She went on to point out that healthcare is a lot more than hospital corridors and trolleys. Most health care in Dublin Central is primary & community based therefore greater investment is needed in community GP services and in prevention of health risks. She pointed out that one in four will have a mental health difficulty yet the area only gets 5% of the health budget. " If someone presents at A and E they will get treatment, they will get a bed (after a period) but if someone presents with a mental health issue - eating disorder, suicidal - it is a very different matter. Those Victorian institutions must be closed." A billboard protesting against Fine Gael’s plan to re-introduce stag hunting in Ireland – planned for a site close to FG’s HQ In Mount Street, Dublin – has been pulled. Maureen, who is President of Irish Council Against Blood Sports, ICABS, to gether with the Vice President Noel Gregory, joined a group of campaigners from the animal rights group ARAN in their protest yesterday afternoon. Ad agency JCDecaux told campaigners that the ‘blood’ spattered image above is not considered suitable for the spot, metres from the party’s office. 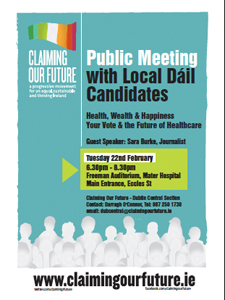 On Tuesday 22 February, Maureen will take part in this very important debate on the future of Health Care called claiming our future. We hope that you will come in numbers to make your voice heard on this crucial issue for the people of Dublin Central.